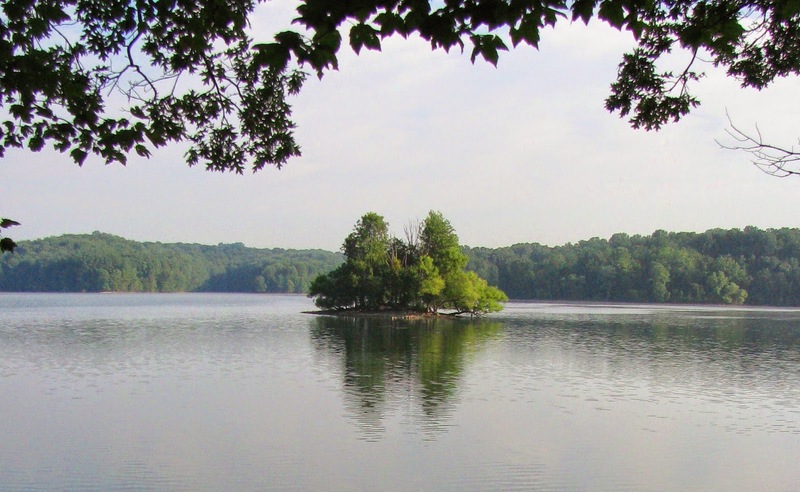 Liberty Reservoir, the City of Baltimore's water supply, is surrounded by an uninterrupted buffer of public forest land with an extensive network of fire roads. To this, add one amateur mountaineer, home from his ultimate bucket-list quest and looking to stay fit. The result - a month of hiking joy while scouting an 81 mile circuit hike around the lake. This was just the first milestone in a path that has now extended to 8,550 documented miles and continues to grow. How does a fearsomely aggressive, newly discovered, invasive species (first identified in North America in 1996) lead to a successful double thru-hike of the Appalachian Trail? How does that then translate into a retiree's lifetime pursuit of hiking onward toward the endless horizon? Looking back on it all, it seems a perfectly natural evolution. The year was 2010. I was living in a condo within walking distance of the 3100 acre Liberty Reservoir (the view from my favorite secret spot is shown above - there is no trail to this place). Early in the year I had accomplished a major bucket list goal of climbing a 20,000'+ mountain in South America. I was in the best shape in my life and didn't want to lose that fitness. One spring day, I happened to be idly surfing the internet and was looking around the Maryland Dept. of Natural Resources web site when I came across this page about a newly discovered invasive called Wavyleaf Basketgrass. My heart skipped a beat. I had seen this grass. I thought I had seen it on my frequent training hikes on a mile of steep trail in Cunningham Falls State Park. The web page had (still has) an appeal to report sightings and to get involved, so I contacted Kerrie Kyde through the email address given. My report raised a stir because Kerrie had not had any reports of Wavyleaf occurring in Frederick County. This would be a major setback, indicating that the plant had spread more widely than believed. I promptly went back out to Cunningham Falls Park and scoured the places along the trail to Bob's Hill where I thought I remembered seeing the plant. None. I could not find a trace of it. I felt embarrassed. I searched my memories, trying to figure out what was wrong with my flawed mind. And suddenly it hit me. I had seen the grass on the few casual non-training rambles I had taken around Liberty Reservoir near my home--within the range where it had already been reported. I quickly contacted Kerrie and confessed my mistake and apologized profusely. This ignominious start had nonetheless piqued my interest in this new invasive. Kerrie had high hopes of completely eradicating Wavyleaf Basketgrass from this continent before it got too widely established. I volunteered to report to her the specific locations where I found it and then started scouting more of the Liberty Reservoir fire roads and trails around home. One day I even happened upon Ed Uebel, the amateur botanist who had first discovered Wavyleaf back in 1996. That was a thrill for me. Ed was actually a retired Entomologist--a soft-spoken and humble old guy who seemed bemused at my excitement upon meeting him. He was out working a patch of pine woods near Bollinger Mill Rd., pulling Wavyleaf up by hand--along with other common invasives that infest the same habitat--Japanese Stiltgrass and Oriental Bittersweet. As I ranged the reservoir I was finding more and more Wavyleaf--so much that I began to doubt that it could be eradicated, especially since it had established on this sensitive Baltimore water supply watershed where they are reluctant to allow spraying of chemicals to control it. Below is an example of a place where the stuff has entirely taken over. 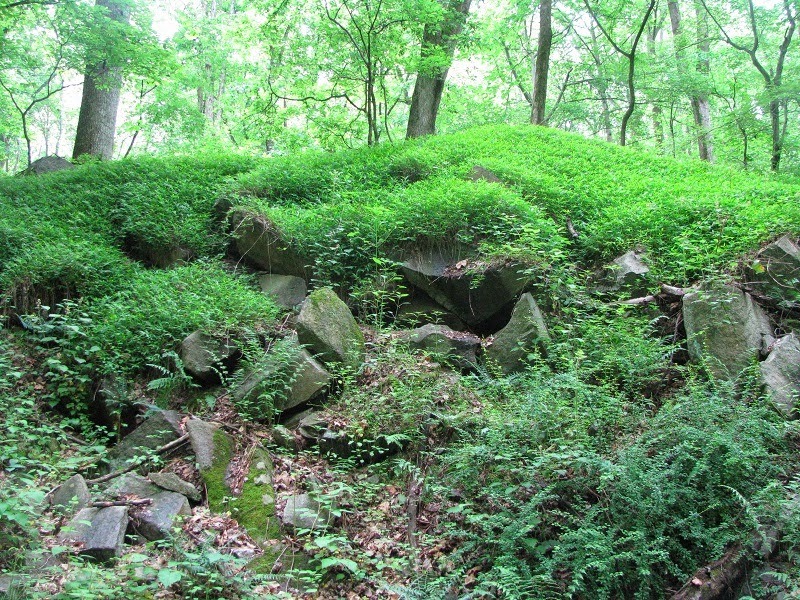 All the beautiful carpet of greenery adorning this rocky knoll is Wavyleaf. As summer approached I was hiking almost daily and reporting to Kerrie my findings using map coordinates and verbal descriptions. Kerrie offered to loan me a GPS so that I could report the positions more accurately, and in a way that would be easier for her to use. GPS! I had never used one--never even considered it. But I remembered my South American expedition where we used a GPS to tell us when we had exceeded the magical 20,000 foot elevation mark. I told Kerrie that her offer was generous, but that I would go ahead and buy my own GPS. I found a new but outdated Garmin unit for sale at REI for a really good clearance-sale price and bought it. And that little gadget transformed my hiking from casual rambling to precisely recorded, reproducible tracks. I was able to bushwhack my way around in the woods and not get lost. I began ranging farther and wider around Liberty Reservoir, and I began to annotate my county map book with my tracks and mileages. As I kept exploring new territory, looking for Wavyleaf, I began to realize how much more fun it was to hike a new and different place every day than to repeat the same few trails over and over, as I had done in my training hikes leading up to the South America expedition. I hatched the idea to hike all the way around the reservoir--to scout a continuous trail and to report it so that others could follow. I accomplished that complete circuit on July 25, 2010. The map below is a consolidation of the map book pages on which I recorded all my travels. It is full of detail and a very busy visual, but that's actually the point. I hiked hundreds of miles in order to identify an 81 mile route around the reservoir - all the light lime-green or yellow-green lines. Unfortunately the chosen route, indicated with the wider green highlighting, includes a couple miles of pure bushwhacking where the reservoir buffer property is too steep or too narrow to contain any fire roads and too remote to have any trails. Okay. Liberty Reservoir circuit hike accomplished. What next? I was staying in shape and loving the routine of doing a daily hike into unexplored new territory. So I started ranging south from Liberty Reservoir onto the adjacent strand of state parkland along the Patapsco River. I learned of the extensive network of trails in that park unit--about 170 miles of them. I also revisited Cunningham Falls State Park and hiked more of the trails there, including the Catoctin Trail, maintained by the Potomac Appalachian Trail Club. Since the Catoctin Trail ends just a couple miles from the Appalachian Trail, I took a few hikes along that famous trail as well. A dozen or so miles south of Liberty Reservoir along the Patapsco River park corridor is Ellicott City, a place I used to live. Sometime while I was doing these hikes in the summer of 2010 I hatched the idea that I would connect my footsteps to that former home and to another former residence in nearby Columbia. At the same time I was falling in love with the AT and hiking more and more of it in Maryland. I wanted to connect my footsteps to that, too, even as I was exploring more of the AT itself. Eventually I got as far south as Harper's Ferry and visited the AT Conservancy office. I talked with the enthusiastic reception-desk volunteer on duty that day--Judith "Judo" McGuire--and with staff there, including Laurie Potteiger and Dave Tarasevich. And I bought some maps. I was getting hooked! I completed the connection between Liberty Reservoir and the AT on August 16th, 2010. Now I needed more new territory to conquer. So sometime later that summer or fall, as I continued to hike the AT south into Shenandoah National Park in Virginia, I resolved to hike to every place I had ever lived. 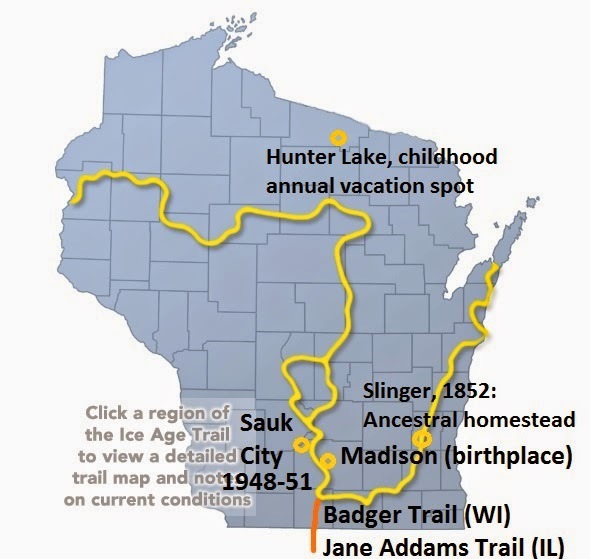 Since I had lived in State College, PA, in Wisconsin, and in Colorado, this would give me nearly unlimited opportunity to keep hiking new trail. And thus was born the idea of a Personal Continuous Footpath - a personalized hike connecting meaningful places in my life. As a child and teen I lived in Delaware and nearby southeastern PA. In the summer of 2011 I completed the hike to those former residences. And later I reached all of my far-flung Maryland residences. The map below presents an overview of this ever-expanding spidery network of connected footprints. Then in 2012 I completed an entire out-and-back double thru-hike of the Appalachian Trail. Now, as of this summer of 2014, I have completed the major 700 mile hike that connects my AT footprints with all my beach-hiking footprints around my new home on Topsail Island, NC. For this I used a large portion of NC's state trail - the Mountains-to-Sea Trail (MST), newly rerouted to pass within just a few miles of my home. 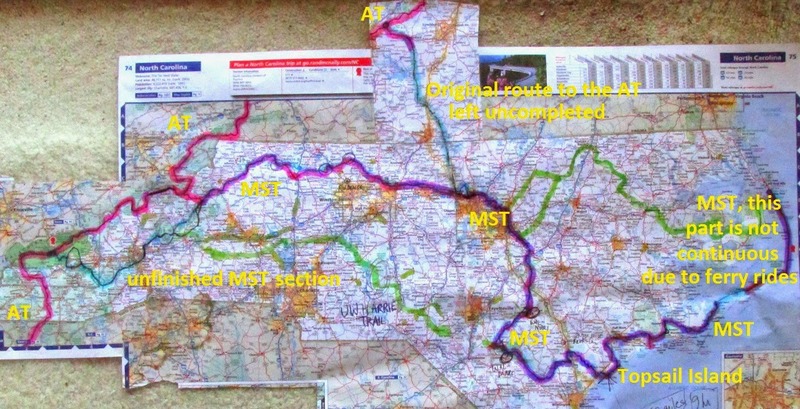 Below is a map of this route (the purple). Again this map is a little busy. 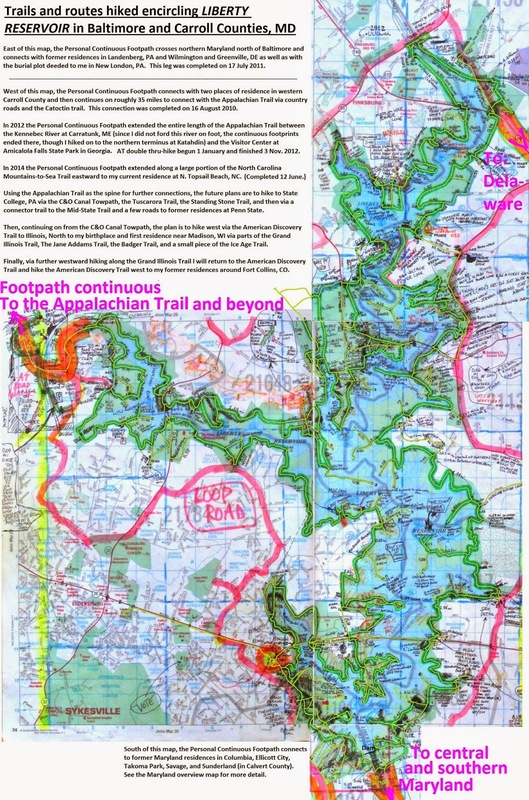 It shows a route from Hillsborough, NC (light blue) that connects up to the AT near Bedford, VA. That was where I had originally planned to make the AT connection from Topsail, but instead I made the connection in the Roan Highlands of NC. That left only a few hundred miles of the MST that I have not hiked. Time permitting, perhaps I will be able to complete that before the calendar year ends and become a bona-fide MST thru-hiker. Next up - I've already started west from the AT toward Penn State, Wisconsin, and Colorado by hiking a piece of the C&O Canal Tow Path. Here's the blog post covering that hike. From there I go up the Tuscarora Trail, veer north on the Standing Stone Trail where the Tuscarora turns east, take a short connector Trail to Pennsylvania's Mid-State Trail (another MST, if you will), and then walk a couple miles on roads to State College, PA where I took my undergraduate education. Then it's back down to the C&O Canal and on west via the American Discovery Trail to Colorado with a detour to Wisconsin via the Grand Illinois Trail, the Jane Addams Trail, the Badger Trail, and finally onto portions of Wisconsin's highly rated state trail, the Ice Age Trail, which comes within a few miles of my birthplace and first residence, and as a bonus, passes right through the center of the town where my German Great-Great Grandfather settled upon immigrating to the USA in 1852.